Six years after stepping into the retail market with smaller mall outlets, Microsoft is literally taking the wraps off its flagship store on Manhattan's Fifth Avenue on Monday, the same day as the general release of its Surface Pro 4 and Surface Book devices. The new flagship, along with a Sydney store due to open in time for the holiday season, signals a global expansion and renewed commitment to reaching out to customers through retail as key Windows 10 devices ship into a flagging PC market. For the Fifth Avenue store's grand opening, Microsoft plans deals on Surface devices, the lowest price anywhere for XBox One consoles and accessories, Microsoft Band 2 purchase before the Oct. 30 general availability, a performance by rapper Pitbull at Rockefeller Center in the evening and a "Halo 5: Guardians" midnight launch event. The new store will also be the only one, for the moment, where consumers can see HoloLens and Surface Hub displayed. The store itself, set to be unveiled in a curtain-dropping ceremony at noon local time, is just a few blocks south of Apple's flagship, the now-iconic giant glass cube encasing the Apple logo. 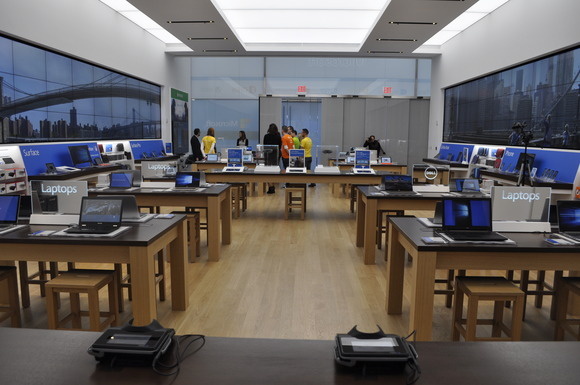 Overall, Microsoft seems to have emulated the sleek ambience of the Apple stores. The glass facade of the Fifth Avenue store, erected with minimal structural attachments so as to seem to disappear when you enter, allows light to flood into three floors of retail space, complete with streamlined, Scandinavian-designed type tables and an "Answer Desk," the company's response to Apple's Genius Bar. The interior of Microsoft's flagship Fifth Avenue store in Manhattan, with the street-facing windows still under wraps right before the grand opening on Oct. 26, 2015. On a pre-opening press tour of the store, the space at first glance seemed to be a bit busier than what you experience in Apple stores -- with possibly more, and smaller, clusters of tables -- but not unpleasantly so. Microsoft has emphasized video displays, placing 198 LCD monitors throughout three floors and a 30-foot, two-story video tower with 36 monitors acting as the store's centerpiece. "It would be bad to compete directly with Apple," said eMarketer retail analyst Yoram Wurmser. "Apple has had incredible success peddling luxury to consumers in the form of technology products that have become a status symbol." The large footprint of the new store gives Microsoft a chance to create unique branding that it hasn't been able to in small outlets or with third-party retail partners, Wurmser said. "Microsoft wants to create an environment stressing its commitment to the Surface and other new products," Wurmser said, adding that retail stores have a multiplier effect on sales for companies that mainly sell via the Web and through channels. Consumers who visit a company's retail outlet tend to spend much more overall on its products than people who never go to one of the business's brick and mortar stores, Wurmser added. Microsoft has established more than 110 stores in the U.S., Canada and Puerto Rico, but the company wanted to wait for the right moment to establish a flagship. "Having a flagship has been a goal of ours since the beginning, but it also was really important for us to have the right location," said Kelly Soligon, general manager for worldwide marketing for Microsoft retail and online stores. You can build it, but will they come? 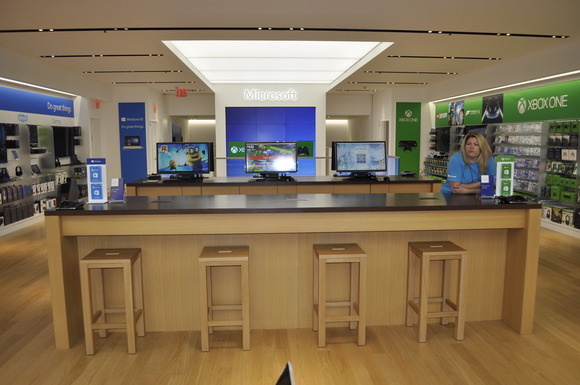 Waiting for customers at Microsoft's Fifth Avenue store before the grand opening on Oct. 26, 2015. The size of the store -- Microsoft has leased over 22,000 square feet in the building altogether -- allows the company to do things that it can't in smaller spaces, Soligon said. The store makes the most of the video displays, offering a Culture Wall designed to showcase local landmarks, and a community theater with space for up to 60 people for educational workshops and special events. Through the store, Microsoft also wants to forge ties to community organizations with an emphasis on STEM training, and as part of the grand opening has awarded more than US$3 million in grants to various local cultural and educational groups. While Microsoft needs to create its own unique branding, it would do well to emulate Apple's top-notch service, eMarketer's Wurmser said. To that end, Microsoft is employing more than 160 store employees speaking 19 different languages, Soligon said. Part of the multiplier effect of a store in this location is its visibility to thousands of tourists who gather in New York's premier upscale shopping district. "We wanted to do it right," Soligon said. "We're beyond excited to be in this location."